Eternal Orthodox Church calendar for the 25.10 year 2017. Tarachus was bom in Syrian Claudiopolis, Probus in Pamphylian Side and Andronicus was the son of an eminent citizen of Ephesus. They were all three martyred together by the proconsul, Hymerius Maximus, in the time of the Emperor Diocletian (284-305). Tarachus was sixty-five years old when he was martyred. When the proconsul asked him three times for his name, he answered all three times: "I am a Christian. "They were first beaten with rods, then, all bloody and wounded, thrown into prison. After that, they were brought out again for further torture. When the proconsul urged Probus to deny Christ, promising him honours from the Emperor and his own friendship, holy Probus replied: "I neither desire imperial honours nor seek your friendship." When he put St Andronicus to even greater physical torture, Christ"s young martyr replied: "My body is before you; do with it what you will." After long-drawn-out torture in various places, these three holy martyrs were thrown into the theatre before the wild beasts. Before them, others were torn to pieces by the animals in this same theatre, but the beasts would not touch the saints; both the bear and the ferocious lioness fawned around them. Seeing this, many people believed in Christ the Lord and cried out against the proconsul. Wild with anger, and more ferocious than the beasts, the proconsul ordered soldiers to go in and cut Christ"s soldiers to pieces, and their bodies lay mingled with the bodies of the others who had been slain. 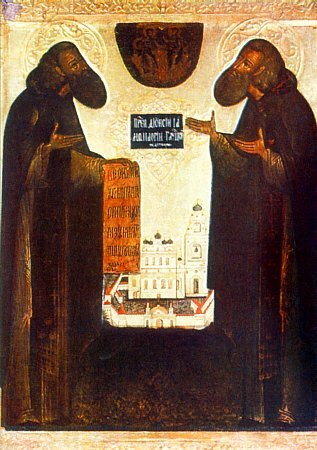 Three Christians: Macarius, Felix and Verianus, who witnessed the slaughter of the holy martyrs, came that night to take their bodies. All the bodies being mixed up and the night being very dark, they, in uncertainty about how to distinguish the martyrs" bodies, prayed to God, and three lights suddenly appeared above the bodies of the saints. They then took them and gave them burial. Born in 316 in Pannonia, in a town called Sabaria, he was the son of pagan parents. His father was a Roman officer, and the young Martin was therefore put, against his will, into the army. He was, however, already a catechumen in the Christian Church, which he had loved with all his heart from his early youth. Travelling one winter with his companions to the town of Amiens, he saw a beggar, almost naked and freezing with cold, in front of the gates. Martin was distressed and, parting from his companions, took off his soldier"s cloak and, with his sabre, cut it in half. He gave half to the beggar and wrapped himself in the other, and went on his way. 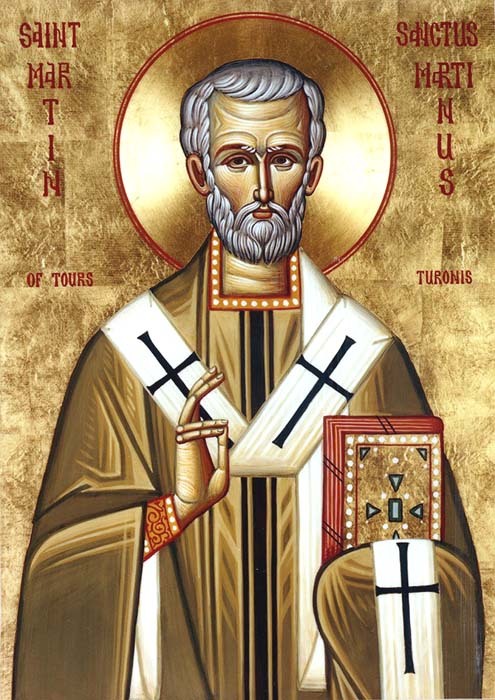 That night, the Lord Jesus appeared to him in a dream, clad in the other half of his cloak, and said to His angels: "Martin is only a catechumen, and see, he clothes Me in his garment!" 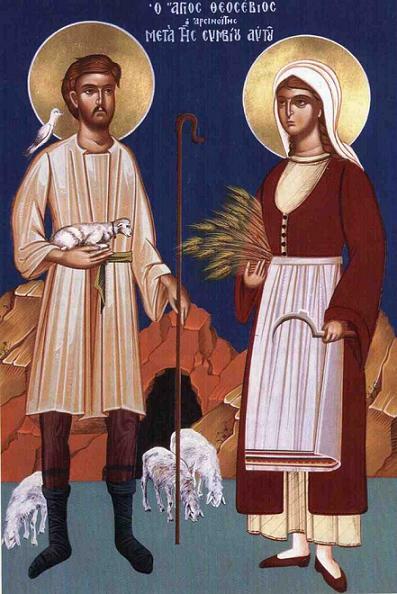 Leaving the army, Martin was immediately baptised, and baptised his mother. After that, he became a monk in the diocese of St Hilary of Poitiers, and spent his life in true asceticism. He had a rare meekness, and for this God gave him abundant wonderworking gifts, so that he could raise the dead and drive out evil spirits. He was made Bishop of Tours against his will. After abundant toil in the Lord"s vineyard and after a mighty struggle with both pagans and Arian heretics, St Martin gave his holy soul into the hands of his Lord in 397. Born in Jerusalem, he was a friend of St John Damascene, whose parents took him in as an orphan and educated him. 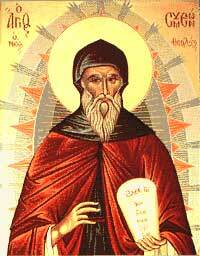 As a monk, he helped St Damascene to compile the Octoechos*, and he himself composed many Canons to the saints. The especially lovely Canons for Lazarus Saturday, Palm Sunday and the Sunday of the Judgement are ascribed to him. He was bishop of the town of Maiuma, near Gaza. 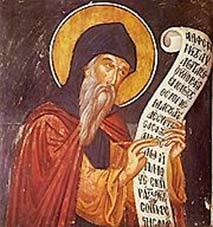 He outlived St Damascene and died in great old age. The Holy Martyress Domnica suffered for confessing Christianity in the year 286. 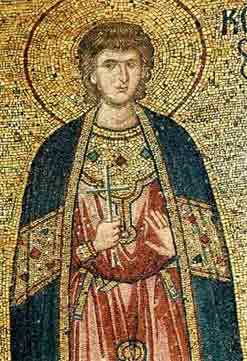 Domnica lived in the region of Cilicia. By order of the governor Licius they beat her for a long time, and burnt her with fire. 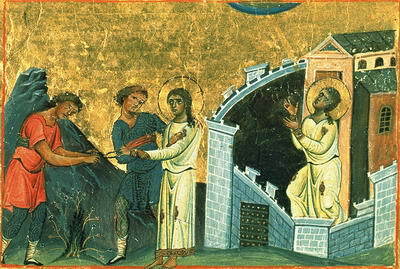 All tormented, Saint Domnica was thrown into prison, where she died.